This week is Universities Week, aimed at showing the importance of Universities to the wider community. On Thursday (subsequently changed to Friday) there will be a ’24 hour Twitter marathon’ in which Universities from across the UK are taking part. The aim is to tweet about the research, work or volunteering you are doing and how it impacts on people outside the University. The message had been sent to a Bath Connected Researchers group which had been established recently and which included a session about Twitter which provided an opportunity for Bath researchers to learn about Twitter and how it could be used to engage with fellow researchers and promote the benefits of one’s research. The national Universities Week campaign, a national campaign demonstrating the benefits of universities within UK society which was “coordinated by Universities UK, the representative body for all UK universities, working closely with a range higher education institutions and organisations, including the University Marketing Forum, the National Union of Students, the Higher Education Funding Council for England, Research Councils UK, UCAS, the University Alliance and GuildHE” provided an ideal opportunity for the ‘connected researchers’, PR and marketing people and others at Bath University to support this campaign and inform the wider community of their various activities. But now that the Twitter marathon is over, how successful was it? What can be learnt from an analysis of how the Twitter users who chose to include the #Uniweek in their tweets? And how well did we do at the University of Bath in encouraging staff and students to use the #UniofBath tag on the day? 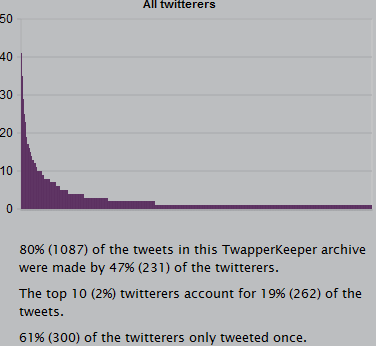 When I heard of the #UniWeek campaign and the associated Twitter marathon the first thing I did was to check that a TwapperKeeper archive had been set of for the hashtag. I was slightly surprised to find that an archive hadn’t been created so, looking at the creation date stamp on Wed Jun 15 15:00:02 GMT 2011 I created the #Uniweek archive. (I should point out that although the TwapperKeeper service is a commercial service developed in the US development work to the service was funded by the JISC and managed by UKOLN last year and members of the JISC sector have preferential access to the service). At the time of writing (Friday 16 June 2011 at 17.10) the archive contains 1,356 tweets – but it should be noted that the archive does not contain tweets posted before 3 pm on Wednesday and so will have missed many of tweets posted on the first three days of the campaign. Although the archive provides access to tweets contained the #UniWeek in order to attempt to gain an insight into how Twitter was used there is a need to make use of a Twitter archive analysis tool. The Summarizr was developed by Andy Powell of Eduserv (and a former colleague of mine at UKOLN) which provides a summary of hashtags which have been archived by TwapperKeeper. Interestingly although the Imperial College, in two guises, appears to have engaged most with the campaign from an institutional perspective, myself and Nitin Parmar work on the same corridor 20 metres from each other, Mark Russell is also based at the University of Bath and the @cendeathsociety account is used by the Centre for Death and Society (CDAS), the “UK’s only centre devoted to the study and research of social aspects of death, dying and the dead body” – a department based at the University of Bath. From this we might conclude that the campaign only seemed to have had significant engagement from Imperial College and the Universities of Bath and Bradford. This seems to be confirmed by the accompanying histogram which shows that 61% (300) of the Twitter users only used the hashtag once. It is unsurprising that @UniversitiesUK, which led the campaign, was referred to frequently. The @JISC and @timeshighered featuring prominently and, as expected, the official accounts for @UniofBath, @imperialcollege and @BradfordUni were also listed in the top 10 as was the @VC_UEL account used by Professor Patrick McGhee, the Vice-Chancellor at the University of East London. uniweek (1159), impcol (401), uniofbath (303), lovehe (46), impcoll (21), britphil (16), newcastleuni (16), ff (15), winchester (12), altlc (10) and panopto (7). Finally in summarising the statistics, where did the Twitterers tweet from? In a post on Institutional Use of Twitter by Russell Group Universities I observed in a survey of institutional use of Twitter by the Russell Group Universities that there seems to be no use of geo-located tweets and suggested that “The location of the host institution should be provided, in text and as geo-located metadata, in order for tweets to be available to location-aware services“. The final figures for 17-18 June were 43 geo-located tweets (~3% of the total number of tweets) of which 30 were from Bath, 11 from London and one from Newport and one from what appears to be the front room of someone’s house in Sutton Coldfield! [Note the accompany image shows the totals taken at 17.36 on Friday 17 June]. Recent posts published on this blog have summarised surveys of Institutional Use of Twitter by Russell Group Universities and Institutional Use of Twitter by the 1994 Group of UK Universities. This post provides complementary survey on use of Twitter to support a campaign which attracted tweets from both institutional, departmental and individual accounts. I suspect we will see greater use of Twitter to support campaign in the future, especially in light of the current political turmoil and discontent over government funding changes across the public sector in particular. There will therefore be a need to reflect on the effectiveness of previous campaigns and to be able to identify strengths and weaknesses. It should also be noted that the tweets listed above are retweets which enable the messages to be read not only by the initial audience but also by followers of the retweeting account – this potential for virality provides advantages over publishing pithy summaries of HE activities on Web sites. I wonder whether there will be subsequent analysis of the content of the tweets in order to identify if there were any key messages being made which might be worth following up? Although the campaign provided an opportunity for individuals to highlight areas of particular interest there may be dangers that a stream of tweets will prove irritating to those following the account (especially if they have not mastered techniques for filtering tweets based on, for example, hashtags). Geo-locating tweets from institutional accounts (for whom there should not be concerns regarding personal privacy) may be beneficial in identifying regional take-up of such campaigns – for example it would be time-consuming to try to determine how take-up of the campaign compared across England, Ireland, Scotland and Wales. 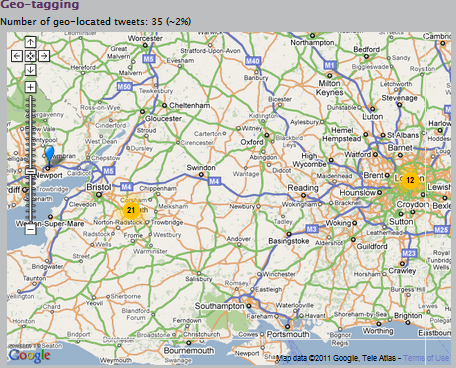 And what of use of the #UniofBath hashtag? View the Summarizr page and judge for yourself! But note that if you want the statistics for a specified period you should read the post of Conventions For Metrics For Event-Related Tweets – and here’s an analysis of the tweets on 17-18 June 2011.